Architect: James Holland, Erasmus Carr, Frank Squires, etc. 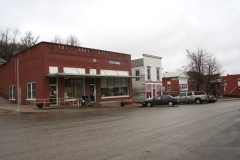 White Cloud Historic District is located in the historic commercial district of the small town of White Cloud, which is situated on the high bluffs overlooking the Missouri River. The district contains sixty-seven contributing resources that represent the development of the town since 1850. 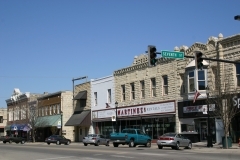 This district includes not only the historic main street, but surrounding churches and residences as well. 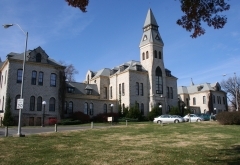 The district is an excellent example of a historic river town in Kansas. 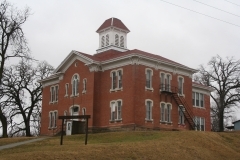 The White Cloud School was built between 1872 and 1873. The two-story building features a red brick exterior with a hipped roof intercepted by a full-height, front-facing gabled bay. There is a central wood-frame bell tower with louvered arched openings. 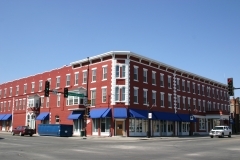 This Italianate-style building was designed by one of Kansas' earliest professional architects, Erasmus T. Carr.